While I’m sitting here writing this post about Instagram food photographers, there’s only one thing I wish: to have more time to practice my photography skills and be able to take awesome pics of my food. Until that happens, I find myself in the enviable position of having part of my job being tasked with scrolling through feeds of excellent food photographers on Instagram. Join me on this delicious trip and discover five talented food photographers who make Instagram a genuine feast for the eyes. Nope, you didn’t die and go to comfort food heaven. You’re just scrolling through @dennistheprescott’s appetite-whetting Instagram feed. If you’re a fan of homemade burgers, baked potatoes, roasted chicken and similar stick-to-your-ribs fare, make sure to hit the follow button. He really deserves his place on the Instagram food photographers list and unfailingly starts my stomach rumbling. HERE ARE THE BEST INSTAGRAM FOOD ACCOUNTS TO FOLLOW ASAP. No foodie account represents the concept of food-as-art as well as @danielkrieger. Take a look at his feed and ask yourself if you ever imagined vegetables could be so photogenic. Among the most talented Instagram food photographers I’ve ever seen, @canellevanille’s captures recall cozy dinners with loved ones. This beautiful feed is a display of gourmet pics with a sensual approach that’s so evocative it’s almost visceral. Seriously, can you smell this apple cake? Because I sure can. This apple cake cooling outside as snow comes down. LEARN HOW TO USE INSTAGRAM CAROUSEL POSTS. Person: What’s your favorite food? Me: Seafood, tacos, pasta and the rest of the food that @nonnompaleo displays on her feed. Not for the vegetarians or vegans among us, this protein-centric destination will have you planning your next mixed grill. Mouthwatering captures for those who watch their carb intake, or for those who couldn’t give a hoot about such things. Got the gardening bug? Enjoy healthy and seasonal cuisine? For fans of farm-to-table eating, take a look at @julieskitchen. Her feed is a wonderful display of fresh food and vibrant colors. Here’s your daily source of healthy food inspiration! ?Mushroom bowl, bialy with veggies and a smoked salmon toast. Also, is there a word that describes that thing where you like something so much you’re scared to order something else in fear that you’ll be disappointed you don’t like it as much as what you usually get?? TIP: DISCOVER EIGHT INSTAGRAM FEATURES & HACKS YOU SHOULD BE USING. Do you know something many of us have in common with these Instagram food photographers? We like to take pictures of our food. 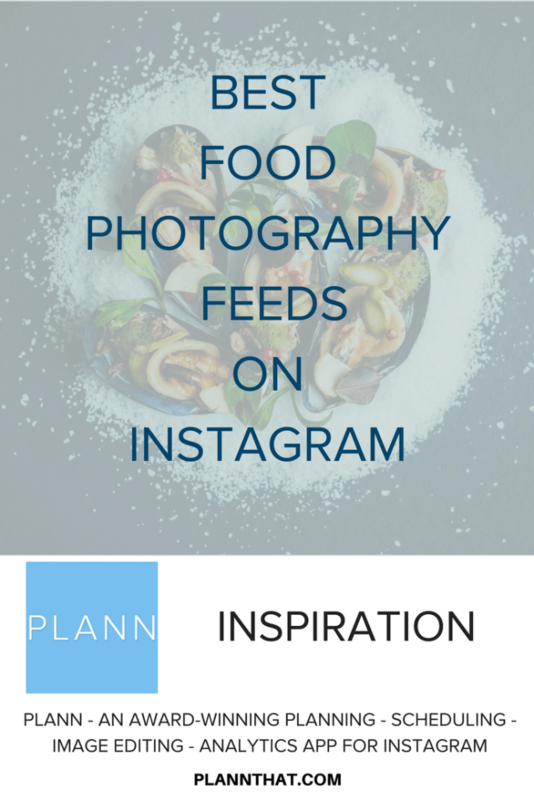 Whether you are a pro or you’re just doing it for fun, food photography is awesome, and it’s especially enjoyable and popular on Instagram. The best part? The Plann app can help you take your photos to another level. You can play with over 60 filters and numerous editing tools, as well as schedule your posts in advance.